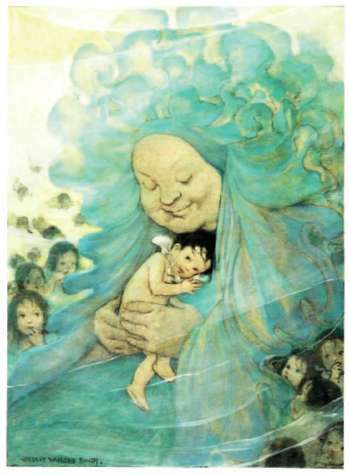 And she took up two great armfuls of babies— nine hundred under one arm, and thirteen hundred under the other—and threw them away, right and left, into the water. But they minded it no more than the naughty boys in Struwelpeter minded when St. Nicholas dipped them in his inkstand; and did not even take their thumbs out of their mouths, but came paddling and wriggling back to her like so many tadpoles, till you could see nothing of her from head to foot for the swarm of little babies. But she took Tom in her arms, and laid him in the softest place of all, and kissed him, and patted him, and talked to him, tenderly and low, such things as he had never heard before in his life; and Tom looked up into her eyes, and loved her, and loved, till he fell fast asleep from pure love. And when he woke she was telling the children a story. And what story did she tell them? One story she told them, which begins every Christmas Eve, and yet never ends at all for ever and ever; and, as she went on, the children took their thumbs out of their mouths and listened quite seriously; but not sadly at all; for she never told them anything sad; and Tom listened too, and never grew tired of listening. And he listened so long that he fell fast asleep again, and, when he woke, the lady was nursing him still. “The doll you lost! The doll you lost!” cried all the babies at once. I once had a sweet little doll, dears, The prettiest doll in the world; Her cheeks were so red and so white, dears, And her hair was so charmingly curled. But I lost my poor little doll, dears, As I played in the heath one day; And I cried for her more than a week, dears, But I never could find where she lay.